William Optics is offering several limited-edition telescopes as the company continues its 20th anniversary celebration. These are very limited, and when they are gone there will be no more, so if you see one that fits your eye and budget don’t hesitate to grab yours! The ZenithStar 71 ED Doublet is a small-aperture, extremely-portable ED scope that offers excellent mechanics, fit and finish. It comes with the latest WO 2-inch rack-and-pinion two-speed fine focuser that replicates the smoothness and lack of backlash normally associated with a Crayford focuser, with the advantage of increased mechanical strength. It can be fully locked and will not flex or slip even with a heavy camera combination. The telescope offers Japanese imported Ohara ED glass in an air-spaced doublet arrangement in a CNC machined ultra-high precision lens cell. Each lens is fully multi-coated with a special superhigh transmission coating (STM Coating) on all surfaces. The telescope is fully baffled to block all extraneous off axis light rays and prevent glancing reflections, increasing overall contrast. The ZenithStar 71 works well with Vixen-style mount dovetail bases as it can be slid directly into the mount without a dovetail plate. 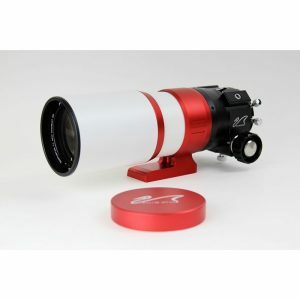 The scope offers a powderpainted white CNC-machined aluminum tube finished in red with a drawtube travel length of 80 mm with graduated scale. The retractable dewshield is WO’s smallest size ever, offering enhanced portability. The telescope comes with a free soft carry back and is retail priced at $598US. The GT71 Apo features a three-element objective using high-quality FPL- 53 extra-low dispersion glass that greatly reduces any secondary spectrum. It offers high-end fit and finish with its powder painted white CNC-machined aluminum tube, gold trim finish, retractable dewshield, and dewshield cap. 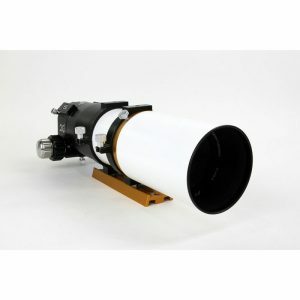 The telescope comes with an extra smooth 360 degree rotatable 2-inch rack-and-pinion V-Power Focuser with 1:10 dual speed eliminating image shifting during astrophotography. The focuser has stainless-steel reinforcement inserts on both sides and on the back to facilitate heavy loading. It comes with two locking screws on angled positions for heavy load applications as well as an aluminum knob with installed thermometer. The telescope is retail priced at $798US. 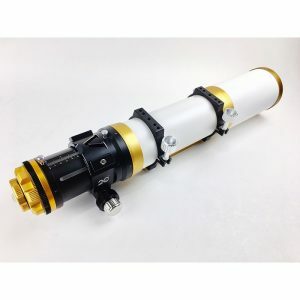 Offering superb quality for imaging and visual use, this is a compact scope that is well suited for travel and you’ll enjoy showing it off as much as using it as the powder-painted white CNC machined aluminum tube with its gold trim finish is visually stunning. The GT81 Triplet is a three-element super apo, which offers an air-spaced objective (FPL-53) in an adjustable CNC machined, ultra-high precision lens cell. Providing extremely sharp views with excellent color correction, each lens is fully multi-coated with STM Coating on all surfaces. It comes with an extra-smooth 360 degree rotatable 2-inch rack and pinion focuser with 1:10 dual speed. It also comes with two locking screws on angled positions for heavy load applications; a large aluminum knob with installed thermometer; a graduated scale for precise camera alignment on focuser tube; top mounted 50-mm finder bracket; 2-inch and 1.25-inch adapter and a L-bracket Vixen/Synta-style dovetail base. The suggested retail price is $1,058US. 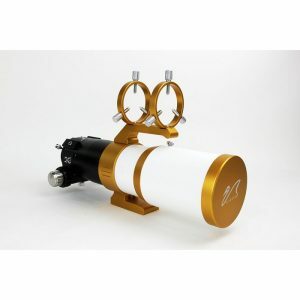 The William Optics GT 102 Apo is presented in a pristine white finish CNC machined aluminum tube with blue or gold trim. The GT 102 features a three element objective using high-quality FPL-53 glass combined with other extra low dispersion glass that reduces to a high degree any secondary spectrum. Each lens is fully multi-coated with STM Coating on all surfaces. The package includes tube mounting rings; retractable dew shield and dewshield cap; 3-inch Victory Edition Crayford design with 360-degree rotatable focuser; two-speed knobs – 1:10; 2-inch and 1.25-inch adapters; Vixen style dovetail plate and soft carry case. The GT 102 APO weighs 11 pounds and is 27 inches in long. The suggested retail price is US$2,398US.